The United Nations Development Programme (UNDP) inaugurated the Wetland, based in Kramovik village, Rahovec Municipality, where 1100 residents are set to benefit. The project aims to address the acute problem of wastewater pollution reaching the White Drin river and forms one of six pilot projects under the Global Environment Facility’s (GEF) ‘Drin Project’**. Currently, all wastewaters from Kosovo households (i.e. from toilets, sinks and bathrooms) are discharged directly into rivers in the Drin Basin without proper treatment. This is a risk for water quality, wildlife and the overall sustainability of the river. Many initiatives have been launched in the White Drin to reduce pollution, for example, Wastewater Treatment Plants in Prizren, Peja, and Gjakova. However, these can be expensive, rely heavily on infrastructure and are primarily designed for urban areas. The Constructed Wetland aims to provide a cost-effective, efficient and easy to maintain solution to wastewater treatment in rural areas. The design is expected to drastically improve water quality in the White Drin, reducing pollution from Kramovik by 90%. By taking the site conditions into account, the Constructed Wetland uses natural energy – such as gravity - and is designed for extreme weather events. 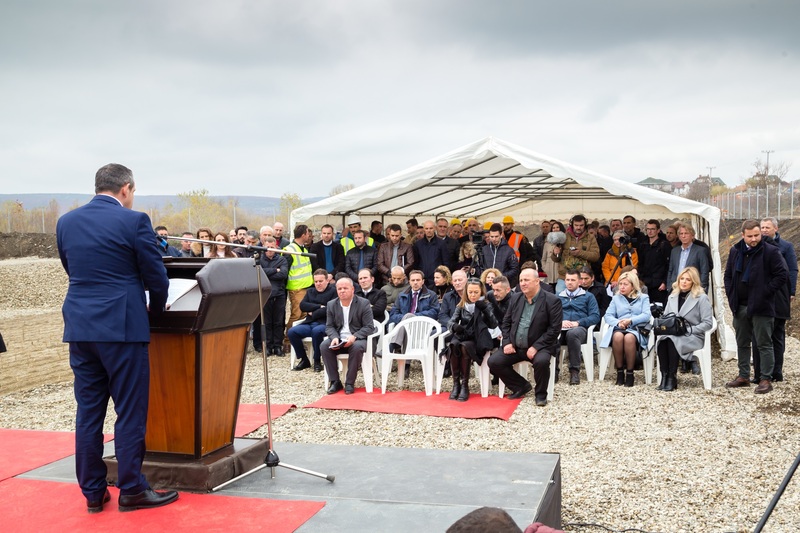 Mr Jemin Thaci, Head of Kramovik village said that local communities are supportive of the project and hoped it will encourage more investment in the future protection of the Drin. The river-bed of Drini is degraded a lot, mostly from sand and gravel extraction activities. In addition to the water pollution from the direct wastewater discharge, the situation is becoming worse and worse. Fortunately, this Constructed Wetland, will help both for reducing the pollution, but also will improve the landscape. The truly collaborative nature of the project is set to make it a success. This includes the Municipality of Rahovec’s decision to allocate land for the project, combined with local community engagement led by Kosovo’s Ministry of Environment and Spatial Planning. Meanwhile, KRU Gjakova SH.A. the regional water company, have committed to maintaining the treatment plant to ensure its sustainability. In the future, treating wastewater through the Constructed Wetland approach can be scaled up, so that if a site falls outside the coverage of conventional Wastewater Treatment Plants– for geographical, technical or financial reasons – wastewater can still be treated, protecting the water quality of the White Drin for future generations. **Full project title: ‘Promoting Constructed wetland for wastewater treatment in small rural settlement – Kramovik Village, Rahovec Municipality’ (implemented by the UNDP). This is part of the Medium Size Project ‘Enabling transboundary cooperation and integrated water resources management in the White Drin and the Extended Drin River Basin’ (funded by GEF). This is alongside the GEF UNDP Full Size Project ‘Enabling Transboundary Cooperation and Integrated Water Resources Management in the extended Drin River Basin’. This is one of six pilot projects taking place under the Full Size Project.